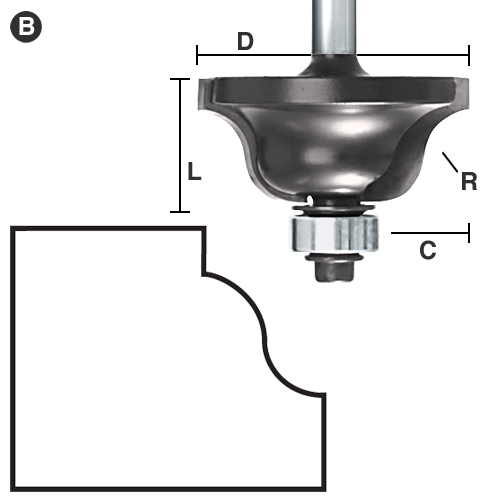 Roman Ogee Bits are for decorative edges on moldings, signs, plaques, furniture, etc. All bits are two flute, carbide tipped, anti-kickback design with bearing guides. B 5/32" 5/16" 9/16" 1-1/8" 1/4" 2-3/16"
B 5/32" 5/16" 9/16" 1-1/8" 1/2" 2-1/2"
C 1/4" 1/2" 11/16" 1-1/2" 1/4" 2-3/8"
C 1/4" 1/2" 11/16" 1-1/2" 1/2" 2-1/2"
E 3/8" 3/4" 1" 2" 1/2" 2-7/8"
F 1/2" 1-1/16" 1-1/4" 2-1/2" 1/2" 3-9/16"